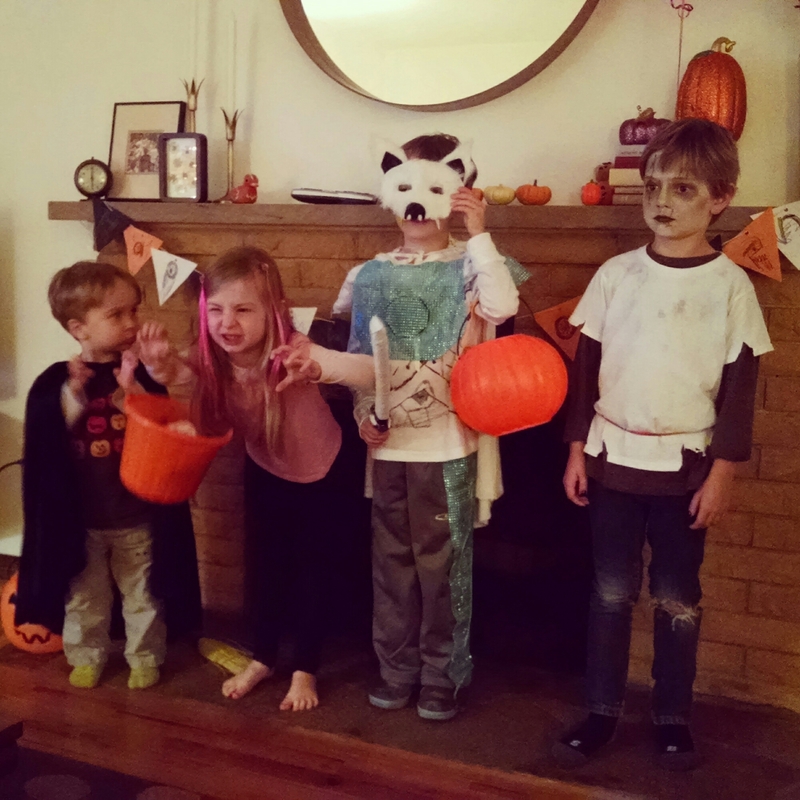 The Fry Family Quartet spent Halloween with the Groebners in Seattle. We all went trick-or-treating with several other families in the Ravenna neighborhood. Due to some eye-hole issues, Ruby and I decided not to wear our costume heads. That didn’t hinder our ability to collect and consume large volumes of candy. From left to right: James the wizard, Ruby the creeper girl, Teddy the Chima wolf king, and Henry the zombie. 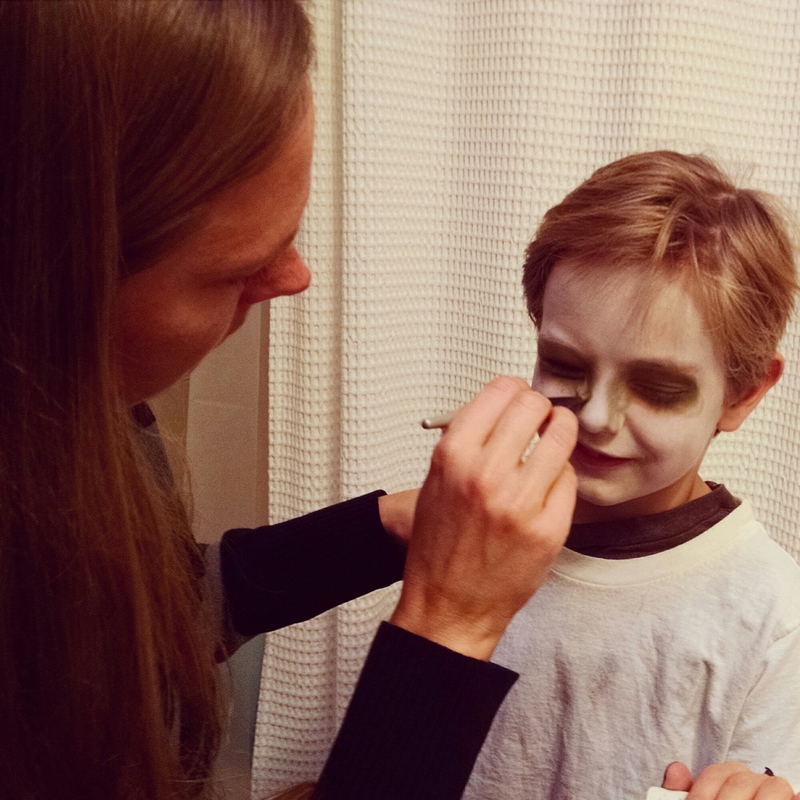 Kristine the make up artist/witch. Today was a proud day at Fry Lodge. 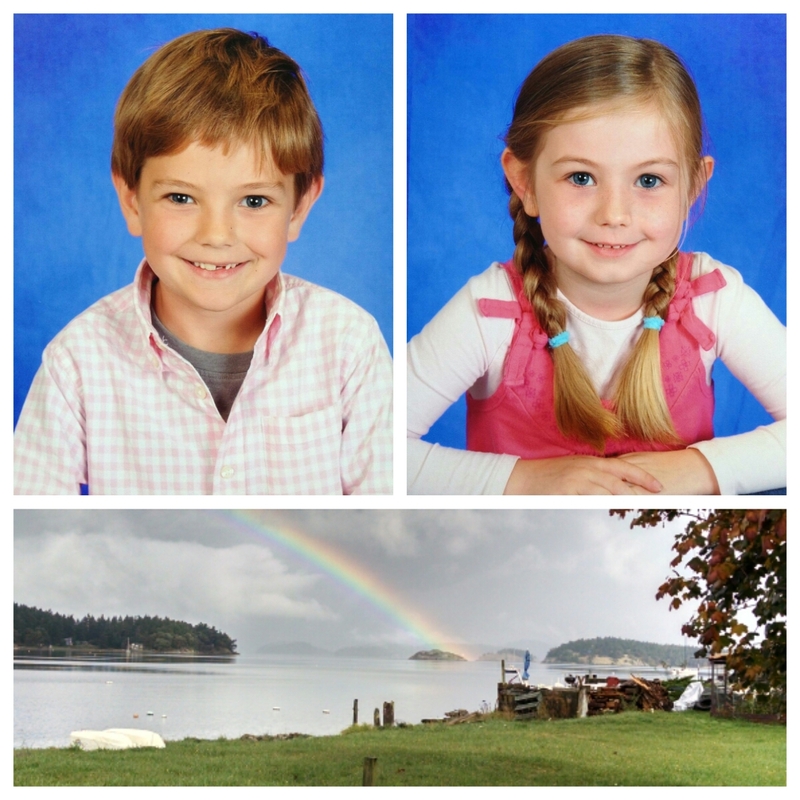 Kristine and I attended our first parent-teacher conferences at Lopez Island Elementary. 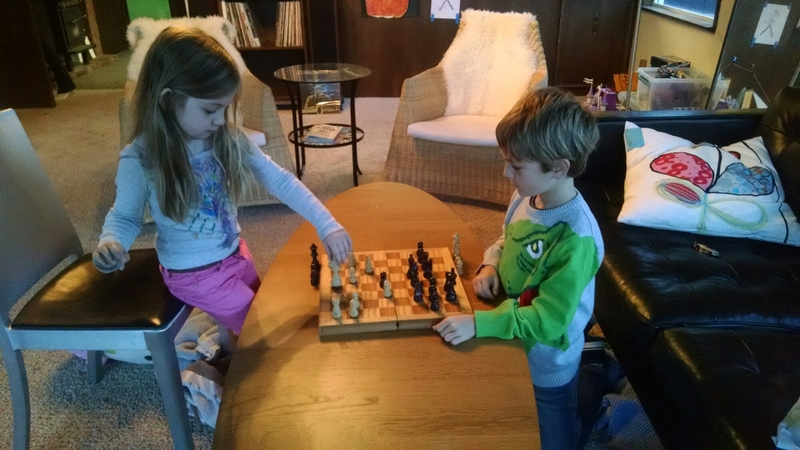 These things always bring on a bit of parental anxiety, as we’re never quite sure what Henry and Ruby are like when they’re not under our watch. Well, according to their teachers, they are both exceptional. They score at the top of their respective classes academically, and they are apparently very kind to their fellow Lopezians. The standardized reports were littered with “above average” comments from their teachers. I really hope this trend continues for the rest of their lives. For some reason I’ve never really invested much in Halloween costumes. For the past five years I’ve simply donned a banana suit and called it good. That banana suit is currently buried under countless boxes deep inside a Sedro-Woolley storage unit. So, with only a few days to go until Halloween, I had to get creative. The idea came to me as I was picking up stray LEGO heads in the living room the other night: LEGO Fryman. 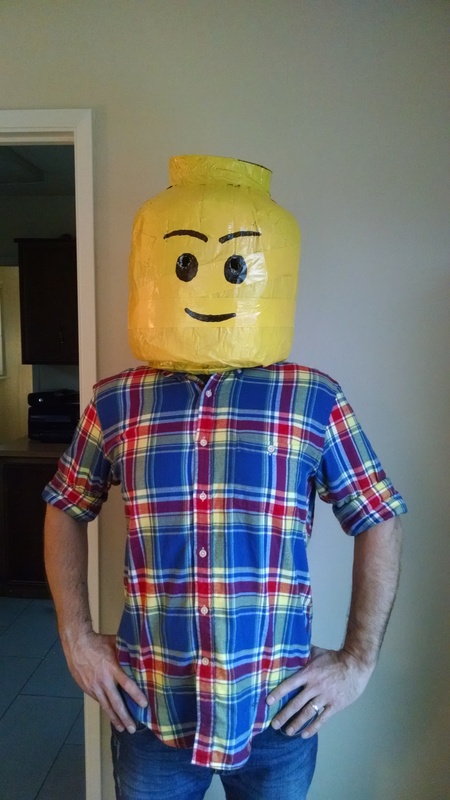 The first challenge was figuring out what household item I could use to construct the head. I knew paper mache would be involved, but the balloon method didn’t seem like the right way to go. So I used a propane tank. 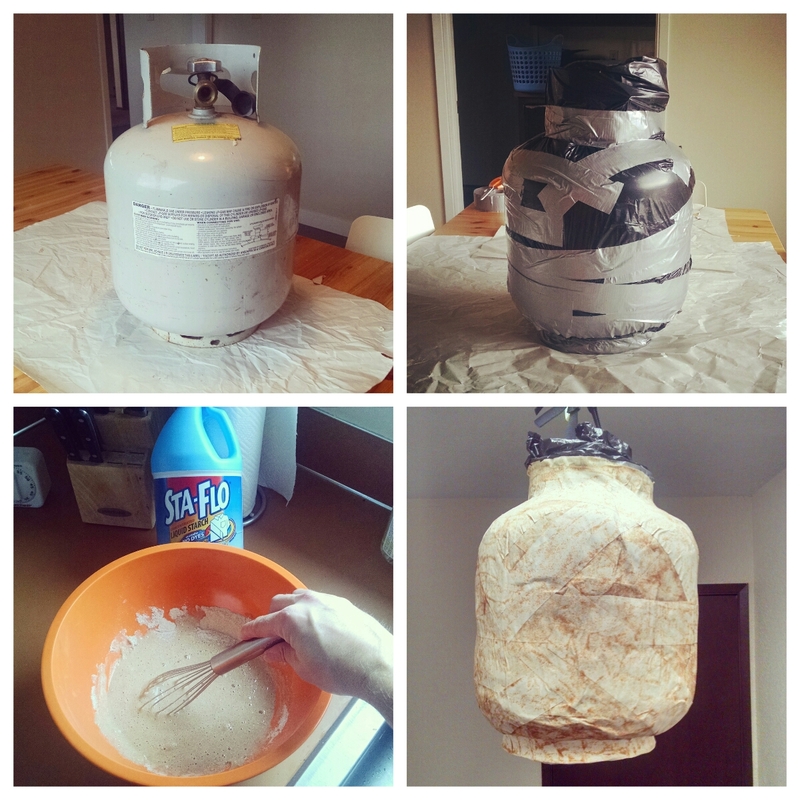 I can’t help thinking that I’m the first person in history to paper mache a propane tank. You have to admit, it closely resembles a LEGO head. 1) Clean off one of the four (four!) propane tanks I have in the garage. Did you know that propane tanks expire after 12 years? 2) Wrap it in a garbage bag and duct tape in order to more easily get the paper mache off the tank later. 4) Cut off the paper mache coat before it dries, otherwise it might crack. Tape a bike helmet to the inside. Hang to dry. Then apply more duct tape to the seam and places that might need structural support. 6) Paint it yellow and try on again. 7) Have Kristine mark where she thinks my eyes should be, then cut the eye holes. 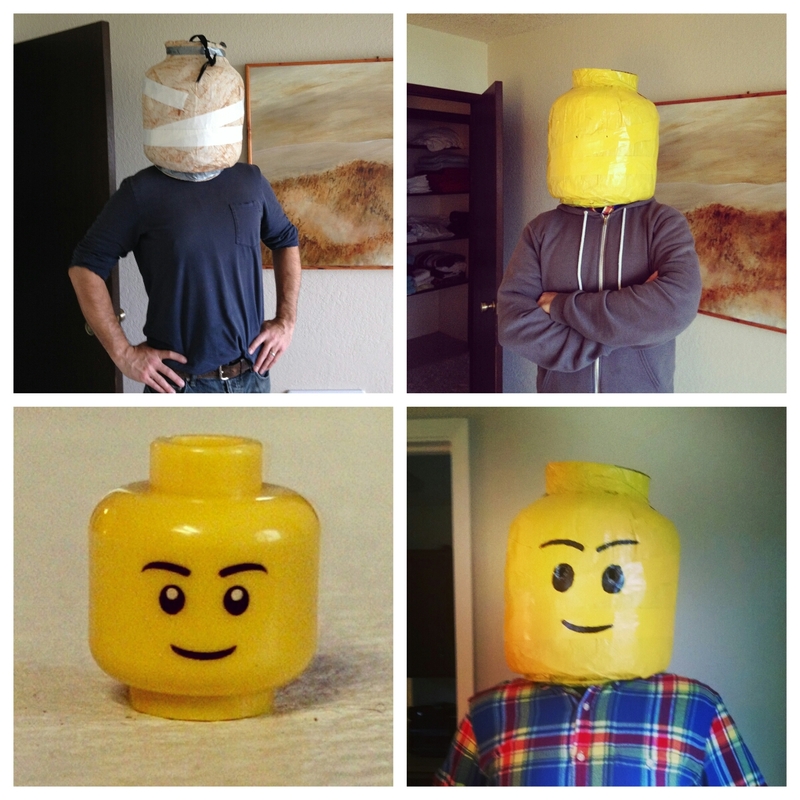 8) Choose from hundreds of Henry’s LEGO heads as a reference for the face, then draw the face with a Sharpie. 9) Try it on again and ask Henry and Ruby how it looks. They said it looks awesome! 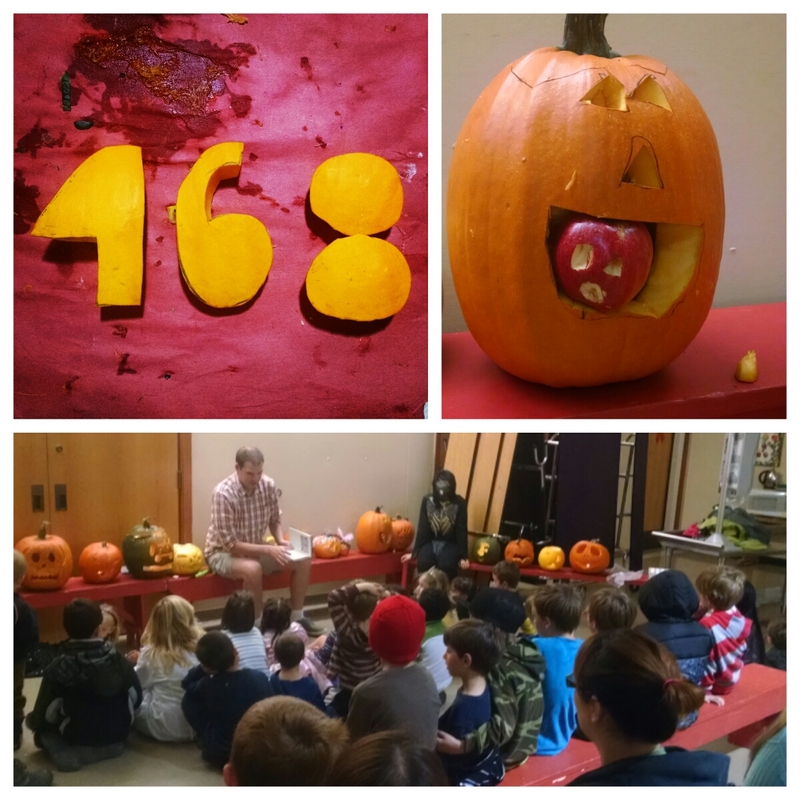 This evening, the Fry Family Quartet attended a pumpkin carving party at school. They supplied both the pumpkins and the carving knives. The whole time Henry and Ruby were carving, I kept thinking about how the Lopez Island medical clinic isn’t open on weekends. 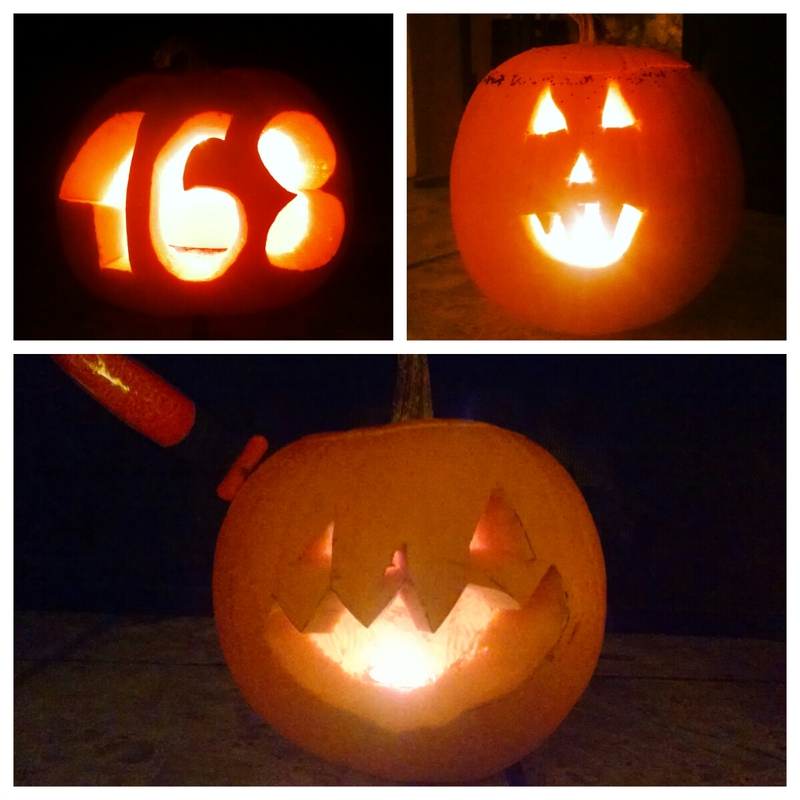 Luckily, both kids lost interest in carving when story time started, so I gladly finished the knife work. We ended up with probably the best jack-o’-lanterns we’ve ever had at Fry Lodge. I’m staring at them as I write this blog post. Everybody else is asleep. The wind is blowing hard outside. Great. Earlier today, Ruby and I attended a birthday party for one of her school friends. On my quest to make more friends on the island, I jumped at the chance to accompany her so I could meet other parents. It was awesome. While I mingled, I quickly lost track of Ruby as she and 20 other 6-year-olds appeared to be playing some version of Lord of the Flies in the hosts’ front pasture. After some chit chat while standing around the fire pit, the party host showed me what was hanging in the shed. 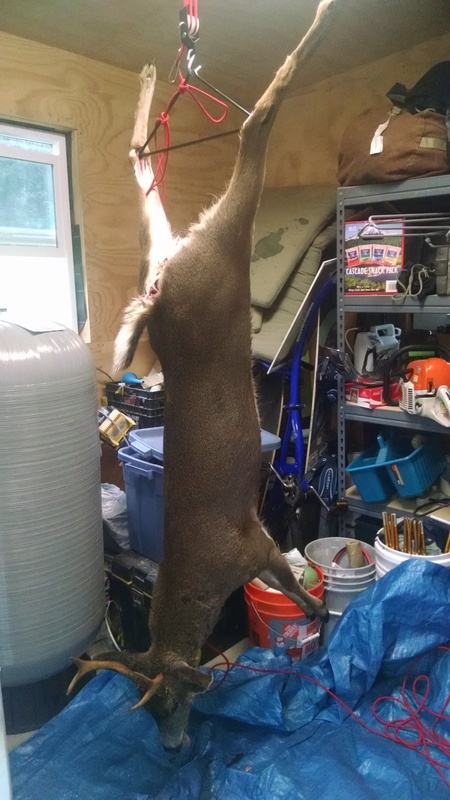 He had shot this little fella in his back yard earlier this morning. My dreams should be interesting tonight. I used to wake to screams because Henry or Ruby had pinched their sibling. Now I wake to screams because one has taken the other’s queen. That’s the stated goal of the Lopez Solid Waste Disposal District, which manages the Lopez Island Dump. We make a biweekly trip to the dump to get rid of Fry Lodge trash and sort our recycling into a wide variety of bins. Lopez recycles everything, so the sorting process gets pretty tedious. Or, fun – if you happen to be between the ages of 5 and 7. 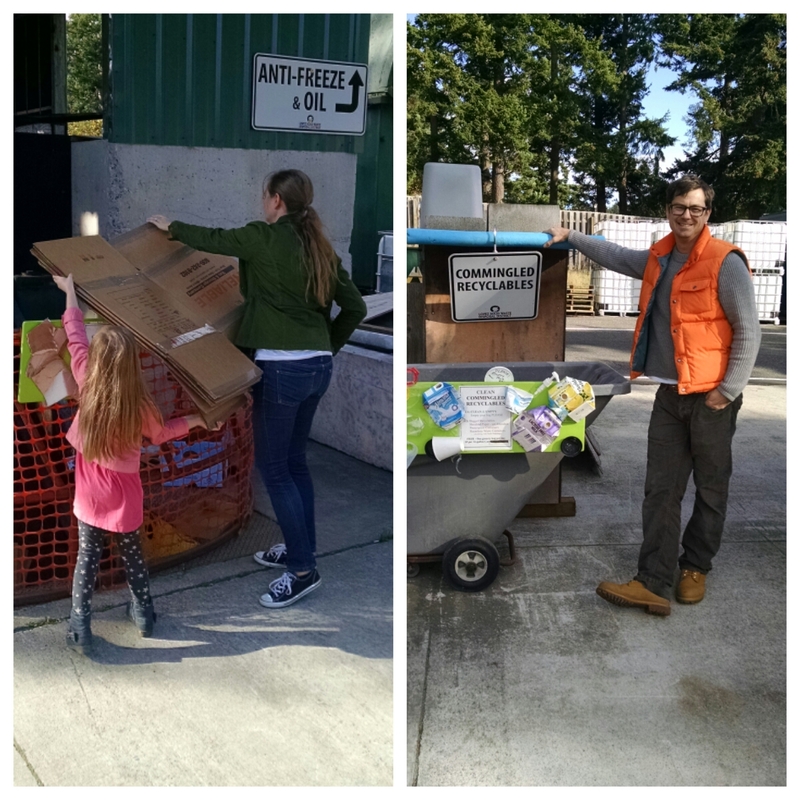 Henry and Ruby love going to the dump so they can help sort. The corrugated cardboard conveyor belt is their favorite station. I always have to make sure there’s enough cardboard for each of them to throw onto the belt. Tossing glass bottles into the glass dumpster is pretty fun, too. Oh, and the magnet to determine whether a can is steel or aluminum could easily amuse them for an afternoon. I think our collective favorite thing about the dump, though, is “the mall,” where people are encouraged to leave discarded objects instead of throwing them away. This place is swarming with Lopezians on weekends. 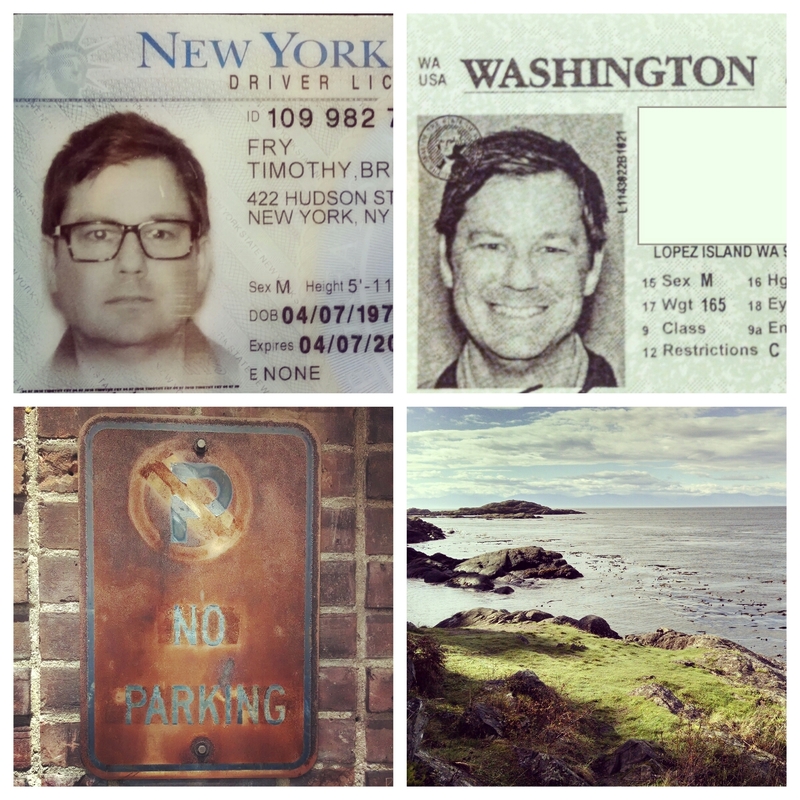 Yes, we have a slightly different lifestyle than we did in the West Village.